Since the original PBS program and the subsequent illegal disclosure of educational records by Eva Moskowitz (see our cease and desist letter), more details and instances of the widespread nature of suspensions and push-out tactics of Success Academy charters have been documented in this NY Times article. Fatima's FERPA complaint to the US Department of Education sent this morning is below; for more on how Moskowitz violated FERPA and the federal student privacy rights of Ms. Geidi's son, see this Slate article. Sign the Color of Change petition, to demand that the US Dept of Education stop granting Success Charters millions of dollars and contributing to the Kindergarten to prison pipeline. My name is Fatima Geidi and I reside at the following address: [removed] I am the mother of [name removed] age 10. [name removed] was a student at Upper West Success Academy charter school at 145 W 84th St, New York, NY 10024 from August 2011 to Feb. 2014. The principals of the school during that period were Caroline Roby and Paola Zalkind. The current principal of the school is Jennifer Haynes. The CEO (or Superintendent) of the Success Academy Network is Eva Moskowitz, whose office is located at the following address: 95 Pine Street, Floor 6, New York, NY 10005. I was not contacted at any time beforehand and did not give my consent to the disclosure of my son’s non-directory education record. I subsequently learned that on October 21, Ms. Moskowitz had sent a second letter to Ms. Woodruff, repeating her false claims that my son was suspended for “conduct dangerous to other students and himself.” This letter is still posted at [removed] and is attached. On October 23, Ms. Moskowitz replied to my cease and desist letter, claiming a “constitutional right” to divulge details from my son’s disciplinary record. This letter was originally posted to the Success Academy website but now only the first part is, with my name removed at: [removed]. The original full letter is attached. As of today, October 30, 2015, these letters containing non-directory information from my son’s education records are still displayed at the Success Academy website at the above URLs. These letters have been linked to by many blogs and media outlets, including the PBS website. These repeated disclosures by Ms. Moskowitz of my son’s disciplinary record are egregious and willful violations of FERPA and his federal right to privacy. I request your urgent intervention in this matter to limit the harm that has already been done to my son in violation of federal law. I certify that this information is accurate and true to the best of my knowledge. Helen Rosenthal to DOE: more public transparency around millions of dollars in contracts needed! Helen Rosenthal, chair of the City Council Contracts Committee, has been a persistent advocate for more public transparency around DOE contracts, to stem the waste, fraud and corruption that caused millions of dollars in taxpayer dollars to be squandered, as occurred during the Bloomberg administration. After last year's mindboggling fiasco of Custom Computer Specialists, in which the Panel for Educational Policy rubberstamped a contract originally worth up to $2 billion over nine years, later reduced to $1.1 billion, for a company that had engaged in a kickback scheme against the DOE just a few years earlier, the DOE promised her that they would make more information public about proposed contracts at least seven to ten days before the PEP vote. Luckily, City Hall eventually rejected the Custom Computer Specialists contract, but the same lack of transparency persists -- with the same educrats in charge, including David Ross, head of contracts at DOE for the last eleven years. Below is a letter Helen wrote Ray Orlando, CFO of DOE, last week. During the Nov. 19 PEP meeting, they will vote on a $105 M no-bid contract for Apple computers and some high-priced consulting contracts. Every month, numerous preK contracts are approved, with little or no information provided in advance. After she sent this letter, the approval of some potentially huge technology contracts, including a mysterious new data system called TAARIS and the possible replacement for the Custom Computer Specialists contract, was shifted from from the November meeting to the December meeting, as usual with no information about the potential cost or vendors provided. None of this inspires confidence in the integrity and the rationality of the process. A FERPA complaint to the US Dept of Education Family Compliance Office will follow soon. As you are well aware, regulations governing compliance with the Family Educational Rights and Privacy Act of 1974 require that educational agencies and institutions obtain a parent’s signed and dated written consent before they are allowed to share non-directory personally identifiable information from a student's education records to third parties (34 CFE 99.30). Some of the details of my son’s disciplinary history are accurate but many are not. In any case, I was not contacted at any time beforehand, and I did not give my consent to the disclosure of any part of his education record. Your first letter has now been linked to by many blogs and media outlets, including the PBS website. Your action by disclosing this information which contains significant inaccuracies have caused me and my son great harm, and I demand that you immediately take it down from your website. This disclosure of my son’s disciplinary records without my consent is not only unethical, but also a serious violation of federal law. I hereby demand that you immediately cease and desist from causing further harm to my son’s privacy rights by removing the letter from your website, and ending all unauthorized disclosures. I also demand that you produce an accurate record of all third parties to whom you specifically disclosed my son’s non-directory information without my consent. I will follow up with the remedial steps you need to take to mitigate the damage caused by your unlawful conduct, and to schedule a complete review of all of my son’s school records to correct the inaccurate and libelous information the school has apparently inserted in his education records. Are 5,485 classes this fall that violate the union contractual class sizes a cause to celebrate? Update: I've added videos of Assemblymember Jeff Aubry and CM Donovan Richards. 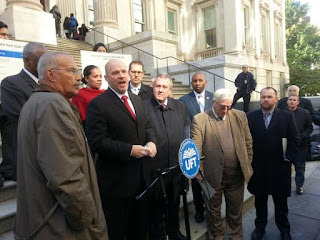 More on the press conference, including some quotes from me in the Daily News, Chalkbeat, Schoolbook, NY Post and PoliticoNY. See also the UFT website for more stats. Today, Michael Mulgrew, the President of the UFT, organized a press conference on the steps of Tweed about class size. He thanked our legislators for bringing home more education funds for NYC schools in last year's state budget, and the Mayor and the Chancellor for seeing that much of it went to schools. He applauded the fact that there were fewer class size violations during the second week of school than last year, 5,485 compared to 6,447 the year before. Then he added that we needed to push to ensure that the full $2 billion extra that we are owed by the state as a result of the Campaign for Fiscal Equity decision in 2003 -- 12 years ago-- is finally provided to our schools. According to UFT data, more than 3,400 high school classes exceeded the 34 students permitted in the teachers contract, and in elementary and middle schools, more than 2,000 classes exceeded thecap with class size limits range from 25 in Kindergarten to 32-33 students. Which means that about 150,000 students -- or more than 10% of all students -- may be disadvantaged by being crammed into classes of more than 32 or 34 kids per class. Guillermo Linares, Donovan Richards, Nick Perry, Bill Perkins and me. 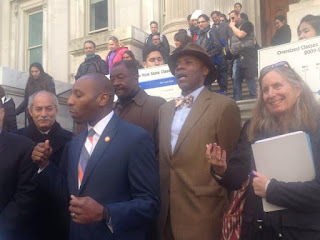 Also speaking with passion and conviction about the need to reduce class size and the importance of NYC schools getting their fair share of funding were Assemblymembers Keith Wright, Guillermo Linares and Nick Perry; and Senators Velmanette Montgomery and Bill Perkins. Assemblymember Keith Wright pointed out that "“There’s no secret to improving schools," merely great teachers and small classes. "We have great teachers and now all we need is smaller class sizes." Senator Perkins said, "Even Stevie Wonder can see that class size matters." City Council Education chair Danny Dromm, and Council Members Alan Maisel, Julissa Ferreras, Mark Levine, Corey Johnson spoke about how class size matters and their commitment to fair funding. Council Member Donovan Richards of Queens said it was a matter of social justice, and that he almost fell through the cracks because of class size at Jamaica high school (now closed.). Council Members Dromm and Maisel, both former teachers, said they simply couldn't do their best with the large classes they were assigned. When it was my turn, I said that Cuomo has a moral obligation to fulfill the judgement of the state's highest court, which found that NYC kids were deprived of their constitutional right because of excessive class size. I pointed out the smaller classes were the top priority of parents in the DOE own surveys, and a top priority of most teachers as well. DOE in December 2015, in their official response to public comment to their C4E plan. For the 2015-16 School Year, NYCDOE will focus Class Size Reduction planning efforts on the School Renewal Program. The criteria for selecting Renewal Schools is [sic] aligned with C4E goals to target schools with the greatest needs. Yet we have reports of many schools on the Renewal list that have huge class sizes, including some that violate the union contract. At PS 111 in Queens, Kindergarten class sizes have risen to 27 this fall, and to 30 in 1st grade. Long Island City high school, another Renewal school, was reported as having the 4th highest number of class size violations, at 140. "Education department spokeswoman Devora Kaye said the city shares the goal of reducing class sizes. She would not say whether the city has set any specific targets around class size, or what steps it is taking to create smaller classes in Renewal schools." According to the UFT, Long Island City, Richmond Hill, and Martin Van Buren HS have since reduced their contractual violations to zero or nearly so. But violations mean classes of 35 or more, and reducing them to zero could mean class sizes at 34 - far from the C4E goal of 25 or less. These class sizes are unconscionable for students who are way behind, in schools in danger of closing, whose classes should be capped at 25 or less to give them a real chance to succeed. This is especially true as the city has a surplus of $7 billion, the Mayor promised us he would reduce class size and yet has been silent on this since his election, and the DOE specifically claimed they would focus their efforts at lowering class size in the struggling schools. At the end of the press conference, Michael Mulgrew was asked about the fact that the Chancellor Farina does not agree that reducing class size should be a priority; and how she has made that clear to parents at numerous town hall meetings. He responded that the union will "keep pushing" and emphasize that "we are willing to work" with the administration on class size. Let's hope they push hard, and make progress with a Mayor and a Chancellor who are not on the same page as parents and teachers on this critical issue. On Nov. 15, we will see whether class sizes have significantly declined this year citywide or in the Renewal schools, when the city releases their annual class size reports.